At noon on Wednesday, the gate to Owl's Head was locked! I'm too old to clamber up the road to the parking lot, so we just had to move on. Very disappointed in the Park people! Topic: Lake Willoughby in summer...very early signs of fall? Re: Lake Willoughby in summer...very early signs of fall? We're booked for Oct. 8-13. I figure that's reasonably safe. I came solo in 1989 during the first week of October. Drove to Weston and the leaves were on the ground. Started snowing! I cut my losses and drove to the Hall of Fame in Cooperstown to salvage the trip. I'm in Texas, practically a continent away from Vermont. So is anyone hazarding a guess as to either (1) the quality of the foliage season and/or (2) the timing of the season? 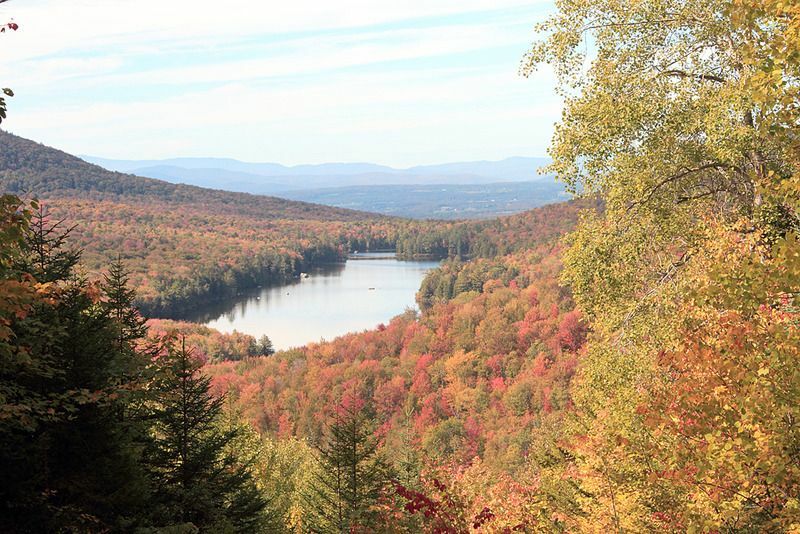 As noted in my post above, there is the view of Kettle Pond from the top of Owl's Head, but also a view from the right-hand path. This is that view, albeit from a lower vantage point. No...not even familiar with that site. Should I try to squeeze it in before I leave? Oct 5 Report. Rte. 232, Owl's Head. Thank you so much for the thorough report! New 4 p.m. forecast on Oct. 2 calls for mostly sunny daytime skies Sunday through Wednesday for sure...and the rest of the week looks good, too. Topic: All rain has been removed from next week's forecast! All rain has been removed from next week's forecast! Now, the only one I checked was the White River Junction forecast, but that forecast probably covers most of the state.